Compass Electro-Optical Systems (Compass-EOS) announced their new core router family based on their proprietary new chips. A key advantage to the Compass-EOS offering is their direct fiber-optic cable connection in their line cards. This eliminates not only the hardware associated with the optical to electrical conversion on the input, and electrical to optical on the output, but also allows for a greater overall through put and switching speed as it operates on a higher data level. An interesting aspect of Compass-EOS is that while they are a direct competitor to Cisco, they are also funded by Cisco and founded by, Michael Laor who is the former Cisco head of the Israel Development Center. 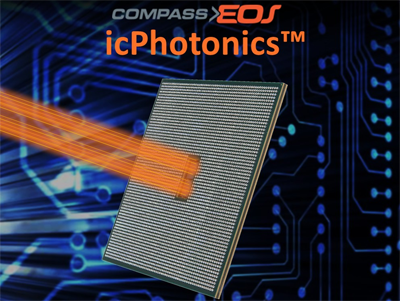 Compass-EOS calls their new technology ” icPhotonics” meaning it’s a direct silicon to optical hybrid. Their first core router, shipping since 2012, is the “r10004”. This is 3x smaller than comparable routers for the same performance. Similar to other routers, it supports full Layer 3 routing functionality for core, peering or aggregation deployments. The r10004 is specified to handle petabit routing demands, and supports direct fiber connections for a mix of two 100 Gig-Ethernet (Gig-E) and/ or twenty 10 Gig-E ports. Overall this is a carrier-grade, modular platform offering 800 Gbps Capacity in a 6U enclosure. Additionally, each of the r10004 core routers can be configured as modular building block to create a network deployment of scale-out routing. Using the Compass-EOS equipment allows the network providers to implement software-defined networking (SDN) and network function virtualization (NFV). The higher level integration, elimination of costly E2O / O2E (electrical to optical / optical to electrical ) components and comprehensive software application layers translates into a lower unit cost, reduction in rack space and reduced cooling costs. Overall, the Compass-EOS r10004 should deliver superior performance with a lower deployment cost. For more information on the Compass-EOS r10004 routers and their icPhotonics technology, please visit the Compass-EOS website .